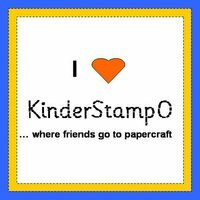 Welcome to "My Vintage Valentine Blog Hop" being hosted by Jesse of KinderStampO. If you have arrived here from Jessica - Thatzuneek than you are heading in the right direction but if you want to start at the beginning go back to Jesse-KinderStampO because I know you wouldn't want to miss any of the fabulous projects, ideas or tutorials that will be shared today Feb 12 and tomorrow Feb 13. Jesse said the sky is the limit for our projects because she loves vintage....lace, pearls, distress, ribbon, etc. Here is my gift bag that I made for the hop and I tried to at least reach the clouds with it!!! I had a burgundy bag from my Christmas stash and decided it would be perfect to do up in vintage. If you don't have a burgundy that use a Kraft bag. I took one of the Tim Holtz Adornments and using Glossy Accent I placed it right on top of the crown that I used from the Tim Holtz Urban Grudge Stamp set. I used this stamp set on all of my bags' project. My tag was distressed with the Tim Holtz distressing tool and Pumice Distress Ink. My glass embellishments I made by going to the jewelery department at Hobby Lobby and buying the pieces, went at home and put them together. I saved a lot of money doing these this way. I now have lots and lots of left over supplies to make more. With my left over paper I made these 3" x 3" mini cards. They will make great gift cards. I will use one for my bag and save the other for another gift. I toke a piece of 3/4" x 10" strip of the Making Memories Je T Adore paper, scored it every 1/8" and then I accordian folded the strip, glue the two ends together and then adhere it to a 1" circle. I placed a 3/4" red circle to the top. My heart is a from a piece of the scrap that I fussy cut; I added Glossy Accent to the top to make it look like a raised embellishment. It had to dry overnight but once it was dried I was able to put it on my red circle. My second 3" x 3" card is again used from the scraps but this time I just distressed all of the pieces using the Tim Holtz Distress Tool and Pumice Distress Ink. I used Tim Holtz Tiny Attacher to give some dimension to my card. My stamp is a Hero Arts Hearts and Flowers , colored with R81 and R83, and then I added just a little Clear Stickles to some of the flowers. My little Valentine sticker comes from Mrs. Grossmans. Now your next stop on the hop is over at Canadian Nickel and I am sure she will have something pretty fabulous to share with you. I found this sweet paper from Girl's Paperie and thought it just screamed to "Vintage" so to be considered for the giveaway you must do the following. I love that vintage allows for mistakes to be covered with ink. That is the prettiest bag I have ever seen! I really like our cards too! My favorite thing about vintage is Lace! I love love love this! I love the pearls on your bag and am going to lift the rosette card idea. I think the glossy hearts are perfect! Great stuff pam!! I love that vintage has a worn, but beautiful and warm feel. Love it! Thanks for the chance to win!! I think that vintage is a one of a kind and It is soft and gently worn look! I have been a follower and try to visit once a week, if possible! TFS!!! I love the look of vintage and the thought of times that were elegant and classy. Your bag is GORGEOUS! Love all the pearl bling! TFS! Great projects, thanks for sharing. I am already a follower and love it. I will share your post on my FB. The thing I love most about vintage is the old feel and of course the lace trim! WOWZERS !!! Incredible projects, specially that gift bag ! LOOOOVE what you did with the flowers ! Martha C.
This is really nice! I love vintage--- love finding the REAL vintage and adding it to what I am working on...problem is, the family does not get it! I am a new admirer, great work! Gorgeous bag and great cards. I'm a follower. Thanks for sharing. I love that bag! The person who recieves that is so lucky and loved!!! My favorite thing about Vintage is the feeling of something being well loved! Glad I found your blog!!!! Very pretty! One thing I love about vintage is the lace! TFS! Beautiful projects. I love the look. Brings the look of the past into the present. Love your creation =) What i love about vintage is that there is a feel to it that takes you back to times where women were ladies and the men were gentlemen. There are still a few selected ones that is a gentleman but it is getting rare. very cute. My fav thing about vintage is that it looks so classic and elegant. Thanks for sharing!! I forgot to leave my contact info, here it is. AWESOME bag I just love the way it came out, I wished mine will look half as good, I am going to give it a try. Thanks for some great inspiration I am a new faithful follower..
love it Pam!!! AWESOME work as always!! Loved the colors, the idea on changing the look of the bag....Great job! This is gorgeous! Glossy Accents are addictive! I love the way you can go for one look when doing vintage and accidentally come up with something totally different but it still works! Love your bag--it's beautiful. I love vintage because I just love old things! Your bag and cards are wonderful!!! To me vintage gives a feel, of love, warmth and character!! Love you bag! Vintage is elegant. Thanks for sharing. New follower. Absolutely stunning projects - great creativity! I dont think you reached the clouds with the project...I think you hit outter space! My jaw is on the floor! LOVE Everything...the cupcake flowers, the glossy accented heart....all of it...Superb job! TFS! I love the gift bag! I love vintage because the possibilities are endless ~ there are so many techniques to use. Your projects are wonderful. The bag and cards have so many great embellishments. Thank You for being in the hop and sharing. Such beautiful projects. Thanks for making and giving such great ideas. This gift bag is absolutely gorgeous and the cards are sweet and nostalgic. I love vintage because it reminds me of simpler, more innocent era when beauty was part of everything from art and clothing to home decor. I think I must have lived in the Victorian or Elizabethan time periods in a former life! LOL I'm already a follower. Thanks for sharing more of yourself with us. Absolutly stunning. Great talent here. That gift bag is just lovely. The cards rock. Your work is amazing. I love how your flowers turned out. My fav about vintage is probably the pearls and lace that you can incorporate into your projects. I shared on FB and I am already a follower. Love your work. Thanks for the chance to win and for sharing your incredible talent. Love your projects already a follower but not a frequent commenter will try to remedy that. I love your cards and gift bag! I like vintage flowers. Thanks I did all of the above. Beautiful bag and cards! I love vintage because of the elegant look and the soft,muted colors. TFS!! What a lovely project! The mini's are my favorite! It is all so prrreeeettty! that is a beautiful gift bag, thanks so much for sharing, i also love your cards!! i love the old school feel you get when you look at vintage items. thanks for sharing and the chance to win! That gift bag is fabulous! Unbelieveablly beautiful! I also loev how you recycled not only the bag but the left over paper to create those awesome cards! Wow this is a nice gift bag! Very girly and chic.